This year’s Forum, themed “Growing Locally, Selling Globally,” brought together more than 1,500 producers, processors, policymakers, government officials, and nongovernmental organizations from the U.S. and around the world. Participants explored timely and emerging topics such as developments in animal and crop biotechnology, global trade trends, frontiers in conservation, and outlooks for food and commodity markets. While there were many highlights throughout the Forum, four themes stood out. In the Forum’s opening speech, Chief Economist Robert Johansson unveiled USDA’s outlook for U.S. commodity markets and trade in 2019 and discussed the current U.S. farm income situation. On U.S. farm income, Dr. Johansson said that while a growing U.S. economy helps farm household income, falling commodity prices in recent years have weighed on farm income. Dr. Johansson remarked that the dramatic fall in net farm income in 2015 and 2016 seems to be leveling out, yet the current expectation of farm income is a long way from the $134 billion peak in 2013. Relative to the 10-year average, real net farm income is down 28 percent. Meanwhile, farm equity has also fallen, but only by 5 percent from the peak in 2014, stabilized by high land values. He noted that overall measures of financial solvency also remain firm, underscored by relatively high land values and current low interest rates. Looking forward, Dr. Johansson said that net farm income is expected to rise, but only slightly, remaining below $80 billion annually over the next 10 years. In discussing the outlook for U.S. agriculture, Dr. Johansson outlined the different and sometimes opposing factors impacting the agricultural economy and driving USDA’s 2019 projections. The broad economic setting, he noted, suggests slowing global growth in 2019-2020. However, the U.S. economy remains strong, with GDP growth expected to average more than 2 percent over the next two years, above the trend since the turn of the millennium. Beyond the general economic conditions, Dr. Johannsson pointed out uncertainties impacting the outlook for crops, livestock, and dairy this year. On commodity prices, Dr. Johansson said USDA’s expectations are for prices for many field crops to rise slightly in 2019, but in general, real agricultural commodity prices are expected to decline over the next 10 years as production growth continues to outpace global demand. “Since 1960, soybean production has increased nearly 1,200 percent, while real soybean prices have fallen by 52 percent. Corn production has grown by more than 400 percent, and prices have fallen by nearly 60 percent,” he added. Another factor currently weighing on commodity prices is retaliatory trade tariffs on commodities. For example, he said, soybean prices fell by 20 percent following escalation of the trade dispute and improvement in growing conditions over the summer. On livestock and dairy, Dr. Johansson said the outlook is for another year of record total meat and dairy production, driven by low and stable feed costs over the past few years and projected going forward. “We project that total meat and poultry production will hit nearly 105 billion pounds in 2019, as production of beef, pork, and broilers all increase,” he said. With expected strong growth in crop and livestock supplies in the United States, Dr. Johansson said, trade will be vital to maintaining U.S. farm incomes. U.S. agricultural exports are currently forecast at $141.5 billion in fiscal 2019, down $1.9 billion from 2018. The share of total U.S. agricultural exports to China in value terms is projected to be 6 percent, down sharply from last year, with China falling from the top market in 2017 to fifth place. But over the longer term, he remarked that the outlook for U.S. agricultural exports looks much better. USDA projects U.S. agricultural exports to continue to grow over the next 10 years, even if retaliatory tariffs remain in place. “Significant growth is forecast for meat and dairy exports, with pork exports approaching 7 billion pounds and skim solids exports exceeding 50 billion pounds by 2028,” he said. USDA expects rising per capita meat consumption in emerging markets will continue to drive international demand for livestock products. At the same time growing global demand for lower fat products, such as skim milk powder and whey, will fuel growth in dairy exports. More moderate growth is forecast for U.S. crop exports. In the case of soybeans, for example, the continuation of retaliatory tariffs leads to lower exports for the duration of the projection period relative to last year’s baseline forecast. Nevertheless, soybean exports are still projected to grow, rising to 61 million metric tons in 2028. Technology—biotechnology in particular—was prominently featured throughout this year’s Forum. Breakout sessions explored a range of technology-related topics including blockchain in agriculture, technology solutions to labor shortages, cellular meat, biotechnology safety, and the role of biotechnology in enhancing agricultural productivity. Biotechnology was the focus of U.S. Secretary of Agriculture Sonny Perdue’s keynote address, where he was joined by Canada Minister of Agriculture Lawrence MacAulay and Mexico Secretary of Agriculture Victor Villalobos Arambula. Secretary Perdue stressed the importance of biotechnology to ensure sufficient food production to feed a growing global population. Secretary Perdue also noted concerns that could undermine the adoption of critical technologies that are already in place or being developed. “We in agriculture must take up this challenge to connect with the consumers we ultimately serve. They deserve to know the facts, they deserve to know the truth. We need to be transparent because we have nothing to hide. Consumers need the truth. Don’t fear your food,” he said. Speakers at the Forum’s plenary session stated that biotechnology is essential not only to meeting growing food demand, but also to maintaining the competitiveness of U.S. producers in the global market. They also stressed the need for regulatory reform to facilitate adoption of biotechnology, arguing that the current regulatory framework doesn’t meet the evolving needs of the industry and has hindered adoption of biotechnology in U.S. agriculture. “We need to figure out how to make sure that either the regulatory system is fixed or how to regulate change to make sure that these products can get to market, because the challenges we face are great and the need is great and we have to find a way to move forward,” said Jack Bobo, Vice President for Global Policy and Government Affairs for Intrexon. 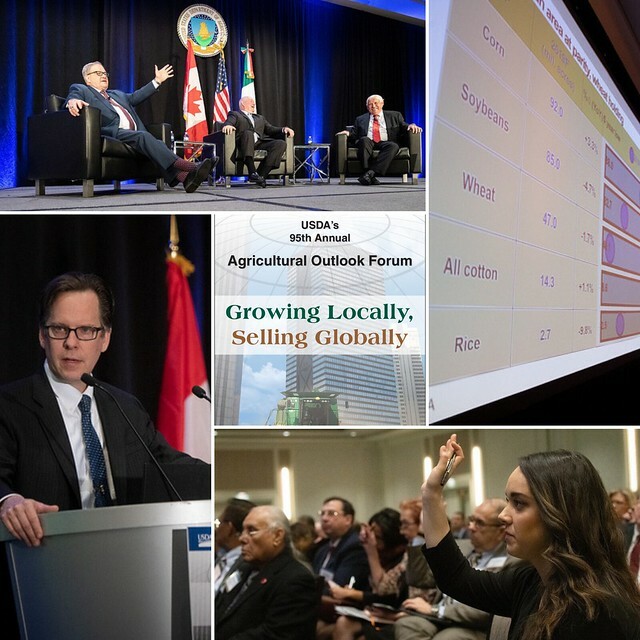 To learn more about the 2019 Ag Outlook Forum, read Dr. Johansson’s full speech or session presentations, visit the USDA Office of the Chief Economist website.